Good stories like those told to us by our parents on childhood days often begin with "once upon a time". Like this one. Once upon a time, there was a rheometer, a measuring device for the determination of the deformation and flow behaviour of materials. Not just one, but four, all high-tech devices from Anton Paar with smart detail solutions. These devices called MCR 102, MCR 302, MCR 502, and MCR 702 meet all rheometric requirements that the analytical heart desires. There is only one thing they cannot do: they cannot automatically measure many samples. This was precisely the requirement of the a big European car manufacturer and thus, the "HTR" system was launched, explains Alexander Schmied, project manager for Anton Paar's HTR system. "HTR" stands for "high throughput rheology" and combines the Anton Paar rheometers with an automatic sample changing system. The system is the successor of the ASC32 and is assembled in the "HTR compact" version (with the MCR 102 and MCR 302) and as "HTR" type (with the MCR 502 and MCR 702). Another European automaker has recently ordered three HTR compact. Up to 36 samples can be stored in these instruments. Two types of measuring beakers are available for larger or smaller sample quantities. In the first step, a gripper arm operated with compressed air takes a measuring cup filled with a sample and places it, if desired, in a temperature chamber for temperatures from -10 to 80 °C. Up to three such chambers can be accommodated in the HTR compact. If the temperature is right, the sample is automatically transferred into the MCR rheometer and measured. Depending on the requirements, a measurement takes from one minute to several hours. After each analysis, the instrument cleans the measuring spindle automatically and resets the measuring cup. "The system measures up to 36 samples independently. This usually happens overnight," explains project manager Alexander Schmied. The first such measuring device was implemented at an automotive company in 2016, where the quality of the delivered car paints is tested automatically. The same happens at another European car company that just ordered three units. Another one is used at a cosmetics manufacturer in central Europe to analyze toothpaste and shampoos. The delivery time for the HTR solutions - the model HTR 302 compact is the most frequently ordered - is around six months. 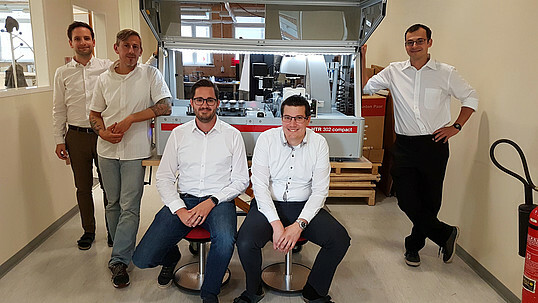 Assembly at Automation & Robotics at Anton Paar's headquarters in Graz takes about one and a half months, then tests with customer samples follow and only after acceptance by the customer the HTR system is finally shipped in a wooden box. The rheometer is supplied separately, installed on site and put into operation by Anton Paar service specialists. Many old stories end with "and if they have not died, then they still live today". In fact, many Anton Paar devices are in use that have reached an impressive age and still function as on the first day as a manifestation of precision and quality. The HTR system has this future ahead.